Thursday’s golf exercise is focused on the shoulders. Shoulder muscles play a huge role in golf and If you have weak shoulder muscles, you will not have any control over your club throughout your swing. From the start and execution of your golf swing, your shoulder joint rotates excessively, while the golf club is moving at up to 100 mph. With all that swinging away, it’s easy for your shoulders to get over-stressed and injured. 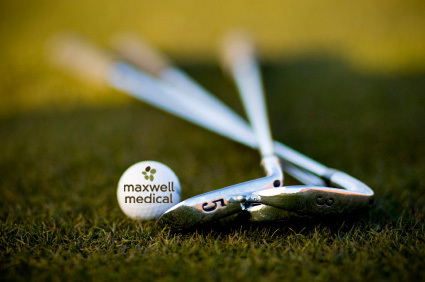 MaxWell Medical is providing you with effective exercises to help you strengthen and stretch that rotator cuff so you can SWING AWAY! Shoulder – Consistent swing plane and control of the club throughout the swing. Exercise – dumbbell side raises. You should select a weight that allows you to do 8 to 12 lifts in one set without too much straining at the shoulder. Aim for 2 to 3 sets. Stand upright with feet about shoulder width apart or a little less depending on your personal comfort. Hold a dumbbell in each hand at the sides or in front. Brace the abdominal muscles and inhale ready for the movement. Together, raise both arms upward while bending the elbows just a little, rather than locking the arms straight at the elbows. Raise the weights no higher than level with the shoulders — a little lower is fine — then lower to the starting position at the sides or in front. Remember to breathe out on exertion (the lift) and in on the return phase. This exercise works the deltoid shoulder muscles, particularly the middle deltoid. Variations include sitting down, lying face down on a bench, going above horizontal with the lift (standing), or starting with weights at the sides, in front or even behind. Variations can target different deltoid muscles and the trapezius. We Got Your (Lower) Back: Tips on improving your Golf Swing! Tuesday’s golf exercise is about strengthening the back, which in many ways is the foundation to a proper golf swing. If your back is in pain you simply won’t be able to play your best, if you’re even able to pick up a club. Here is a simple but effective exercise to really target those often strained lower back muscles. Back – Improve posture, ease of rotation and power through acceleration. Lie on your stomach, facedown, arms straight out in front of you, palms down, and legs straight out behind you. Pull your abs in, as if you’re trying to create a small space between your stomach and the floor. Lift your left arm and right leg about one inch off the floor, and stretch out as much as you can. Hold this position for five slow counts and then lower your arm and leg back down. Repeat the same move with your right arm and left leg. Continue alternating sides until you complete the set. Tune in tomorrow for our lower body exercises. To Swing or Not to Swing! Golf is a game of contrasts. A game that’s as much mental as it is physical. A game where one second you can be screaming in frustration because of a horrific slice you just hit, and the next you are cheering and fist pumping because you just sunk that 35 foot putt. A game where you can call a penalty on yourself! Most of all it’s the only game where your biggest competition, your biggest reason to return to the course even though you just shot a 102, is usually yourself, your drive to find that ever elusive perfect swing. 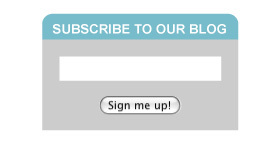 And that neat little segue brings us to the subject of this week’s blog. YOUR GOLF SWING! Now we would never dare to tell you the proper technique to improve your golf swing, for the simple fact that we are neither professional golfers, and because everyone on earth seems to have a differing opinion on the subject. But we would dare to tell you how to get your body in the best shape possible to attempt that swing. 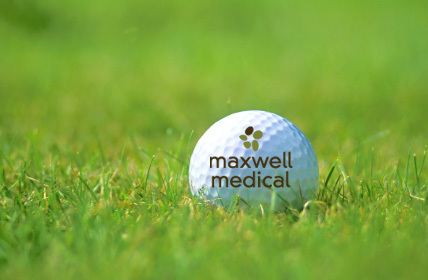 So MaxWell Medical has created a list for this week leading up to Father’s day that will list a part of your body that is essential to your golf swing, why it’s so important, and an exercise to best strengthen that area. And today we decided on giving you a bonus so here are two for the price of one! Chest – Increased swing speed and power through acceleration. Begin in your top of a push-up position with your arms straight and your wrists underneath your shoulders. Move each hand a few inches wider. Bend your elbows out to the sides as you lower your torso toward the floor. Then straighten your arms. This counts as one rep. Complete as many reps as you can with proper form. You probably never knew that so many parts of your body were involved in a simple golf swing, who says that golf isn’t an athletic sport? Again we aren’t experts in the many techniques of how to improve your overall game, but doing targeted exercises like these will make sure your body is in the optimal condition to crush a 300 yard drive from the tee, or make a 30 foot chip from the sand onto the green. Either way it will make sure the screams you will be making will be from the birdie you sunk on the 9th, and not from throwing out your lower back. And keep an eye on each additional exercise that we are going to list daily for the rest of this week, because our goal this summer is to help you Swing.Better!